The Intergovernmental Panel on Climate Change (IPCC) was established by the United Nations in 1988 to, “provide the world with a clear scientific view on the current state of knowledge in climate change and its potential environmental and socio-economic impacts”. The IPCC released its First Assessment Report in 1990 outlining the effects of greenhouse gas emissions on the world’s climate. The fifth and most recent assessment report was issued in 2014. During the intervening years, from 1990 to 2014, world greenhouse gas emissions have increased by more than 55%, from 22.7 billion tons of CO2 in 1990 to 35.3 billion tons in 2013. The first “Conference of Parties” to the treaty was held in 1995. The 21st Conference of Parties (COP21) will be held in Paris in December 2015. The objective of COP21 is to achieve a legally binding and universal agreement on climate with the aim of keeping global warming below 2°C. It is generally accepted that an increase in global mean temperature of 2oC (3.6oF) relative to pre-industrial levels represents the point at which the risk of dangerous climate impacts becomes unacceptably high. In 2009 a series of landmark scientific studies were published that demonstrated rather convincingly that it is necessary to limit total cumulative greenhouse gas emissions to less than one trillion tons of carbon if global warming is to be limited to 2oC. More than half of that total has already been emitted since the start of the industrial revolution, most of it within the past 40 years. “…with INDCs submitted so far, and the planned energy policies in countries that have yet to submit, the world’s estimated remaining carbon budget consistent with a 50% chance of keeping the rise in temperature below 2 °C is consumed by around 2040 – eight months later than is projected in the absence of INDCs”. The IEA Special Report referenced above is to be revised within the next few weeks, taking into account all of the INDCs received since mid-May. A word of caution is in order with regard to the figure shown above. Virtually all of the INDCs are silent as to what the submitting nation is willing (or able) to do post-2030 and, as a consequence, any assessment of the likely increase in global temperature in 2100 must unavoidably be based on assumptions concerning emissions post-2030. 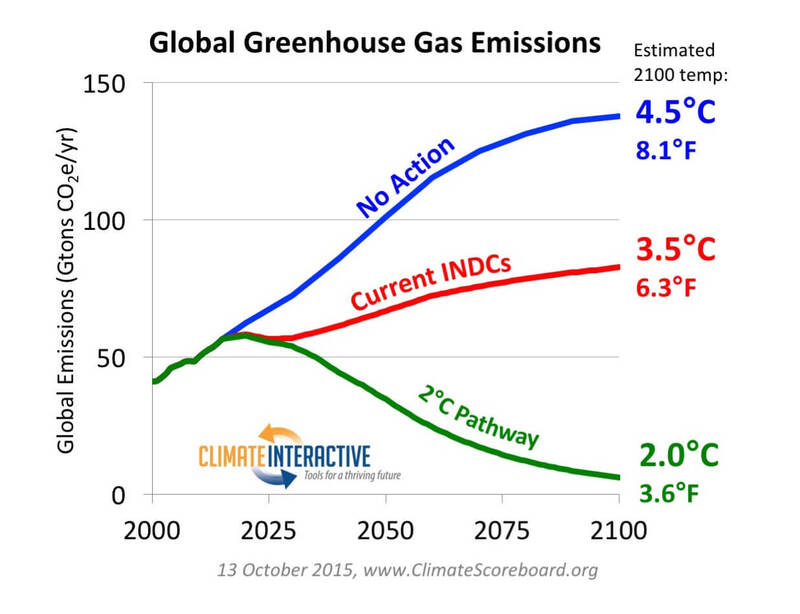 Other analyses, including that of the UNFCCC Secretariat, are likely to differ from the one shown above. It is generally expected, however, that virtually all such analyses will demonstrate that further action will be required of all nations, well beyond those embedded in the current IDCSs, if the 2oC objective is to be met. The Climate Conference (COP21) to be held in Paris in December of this year is widely perceived to be of critical importance for a verity of reasons, not the least of which is that the educated public within almost all nations is becoming increasingly concerned that the threat of potentially catastrophic climate change is indeed real and that collective action on a global scale is critical. As a consequence of this growing public concern, the political tide is shifting in many countries. In recent years, the annual Conference of Parties has drawn more than 7,000 representatives of some 1,500 officially recognized “observer organizations” and a roughly equal number of official governmental representatives from the Parties. Representatives of observer organizations are allowed to participate in the Conference but they play no direct role in decision making. Typically, some 4,000 members of the press/media also attend the yearly Conferences. It is widely expected that any agreement to be reached at COP21 will have to include a formal mechanism of some type for “ratcheting-up” the INDC’s over time, perhaps at five year intervals. It is also generally acknowledged that any binding legal agreement/treaty on climate change that emerges from COP21 will based on the concept of “nationally determined” emissions objectives which can be “adjusted” in some manner should nations, individually, determine that such adjustments are necessary. It is still possible that COP21 will be a complete disaster. There are a number of unresolved issues, including the question of funding. The developing nations are well aware of the immense near-term financial burden that any real effort to curtail greenhouse gas emissions will have on them. They are also equally aware that the developed nations were responsible for most of the CO2 already in the atmosphere. While a funding mechanism is currently in place to help developing nations cope with climate change it is widely seen as significantly underfunded. The developed nations recognize the need for significant funding to help the developing countries cope with climate change, but they simply are not prepared financially (or politically) to commit to a legally binding long term aid program estimated to cost somewhere in the vicinity of 1 trillion dollars per year. Our Perspective – There is a slowly growing awareness within the international scientific community that, on the current emissions trajectory, the 2oC threshold will be crossed well before mid-century, and most likely sometime around 2040. As the IEA Special Report confirms, it is becoming painfully apparent that the emission reduction targets that nations are willing to sign up to at COP-21 are too little and too late, at least in so far as the 2oC threshold is concerned. Perhaps the best that can be hoped for from COP21 is that it will force governments of the world to realize that our fossil-fuel based industrial civilization really does face an existential threat of immense proportions, and that extraordinary measures well beyond those currently believed to be politically feasible will be required in the near future. The fundamental problem is that, despite the best efforts of many countries, it is virtually certain that global warming in excess of 2oC is inevitable this century, and most likely well before mid-century. This entry was posted in COP21 by granger1017. Bookmark the permalink.